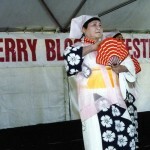 Monterey Park celebrated the annual Cherry Blossom Festival in Barnes Park on April 18 and 19. Mayor Frank Venit and Councilmembers Mitch Ing, Anthony Wong, Betty Tom Chu and David Lau and City Manager June Yotsuya welcomed everyone to this festival, which celebrates spring and the Japanese culture. Alhambra Councilmember Gary Yamaguchi joined in the festivities. 1. 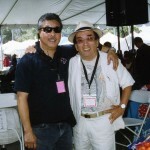 Committee member David Ikeda and Master of Ceremonies Rodney Kageyama shared a quite moment before the party begins. 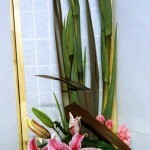 Mr.
Kageyama, an accomplished actor, enjoyed his role as the Cherry Blossom M.C. 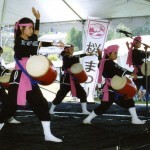 2.Members of the Ryukyukoku Matsuri Daiko opened the event. The played the drums and danced traditional folk dances. 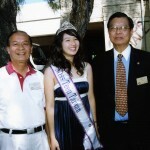 3.Councilmembers Anthony Wong and David Lau welcomed Patrice Chang, Miss Teen Taiwan to the celebration. 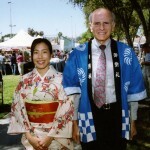 4.Cindy Ota and Francisco Alonso dressed for the festival. 5.Former Mayor and Councilmember Francisco Alonso was introduced to the crowd. 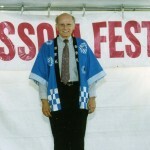 Mr. Alonso is a longtime support of the Cherry Blossom Festival. 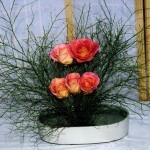 He helped to establish this annual tradition. He calls the Cherry Blossom Festival his favorite city event. 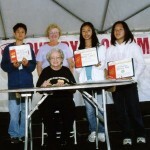 6.Members of the Monterey Park Woman’s Club sponsored the 2009 Essay Contest and awarded Lauren Chin, Jujeong Kim, Clarrissa Hsi, Jackson Chang, Kelly Lau, Jordan Chin, Jesse Han and David Sun with financial prizes for their winning essays and art work. 7, 8.Members of Nippon Minyo Kenyukao Hoshun Kai performed several traditional folk dances. 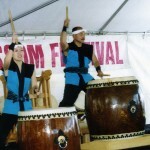 9.Members of the Yoki Daiko beat the traditional drums to the delight of the crowd. 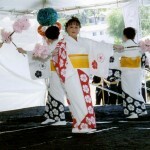 The Taiko drums are one of the longtime favorites of Monterey Park residents and their guests. The event also featured a second stage with entertainment for the younger crowd with traditional American music, Martial Arts and Judo exhibits. 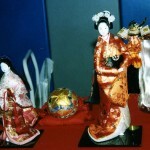 10-13.The gym housed the Art shows, the Doll exhibits, the flower exhibits, the Origami demonstrations, the Sushi demonstrations, puppet shows and the famous Tea Ceremony. 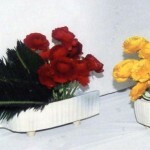 14.Residents and their guests crowed the booths that sold fruit, music, clothes, art, jewelry, household goods and more. The city staff provided information booths. 15. 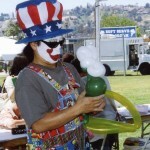 A clown made balloon hats and animals at the Kids Craft booth. Several children enjoyed the game booths too. Local clubs manned the International food booths that sold traditional Japanese, Mexican and American food. 16. 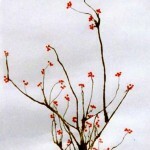 Members of the Monterey Park Bruggemeyer Library featured their famous art (making a cherry tree in blossom) by blowing black ink onto a piece of paper in the shape of a tree and coloring the blossoms in pink. Two cherry trees in full blossom are located next to City Hall facing the park. Garvey Ranch Park is the home to multiply cherry trees donation by a resident to his park. 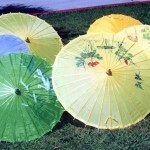 Monterey Park celebrates spring each year with the Cherry Blossom Festival.